A house always needs improvement. Whether you love spending the weekends making your house look amazing, or you procrastinate until you’ve run out of buckets before you fix the roof, no home owner can escape home improvement projects. For most of us, that means getting out the toolbox and fixing things ourselves. It would cost a fortune to hire a handyman for every little fix up, and with the right information always under your fingertips, you can do most things yourself. To get you well-equipped and ready to tackle most DIY projects yourself, we have listed the 8 best home improvement and DIY apps. Painting is one of the most common home improvement projects you’ll find, and it’s not hard to see why. A fresh coat of paint can make a big difference in how a room feels, and it’s one of the home improvement projects that are pretty easy to learn and do yourself. To help you out with your painting needs, most paint manufacturers offer their own app. The one from Behr is particularly impressive, and lets you pick colors from other images, see complementary colors, and examples of how the color was used. For an even wider range of options, Tap Painter lets you upload your own pictures and try out virtual layers of paint to get an idea of the end result. For the most part, the Home Depot app is the typical store app; you can order supplies, get them delivered to your closest Home Depot location, and the app lets you scan bar codes to get the same item again. As a neat bonus, however, their app comes with a few measurement tools that will save you some time figuring things out, like a nut and bolt finder, a caliper, and a rudimentary tape measure that allows you to use your feet to measure the distance across a room based on your shoe size. Sometimes, you can look at a project and know it’s above your pay grade. Other times, you’ve tried and failed, but there is a reason professionals that work around the house are in high demand. With the Handy app, you get an Uber for handyman on your phone. Although locations are still limited, this app shows some great promise for the DIY-er that needs some help. Designing your yard can take a lot of imagination, or the Landscape Design Editor. This neat little app allows you to plan your flowers, trees, and other garden accessories in your own yard. Simply take a picture of the area you’re looking to improve and play around with all the accessories that come with the app. It’s the easiest way to knowing what your yard will look like, without spending a ton on things that may not work. Raise your hand if you’ve ever looked up an online tutorial to figure out how to do a home improvement project around the house. That’s everyone, right? The WikiHow app brings you the tutorials from the website in a design that works perfectly with doing a project and having your hands only available for a limited amount of time. In the app, you can follow the instructions while you work and go at your pace. This keeps your hands free most of the time and still gives you’re the instructions you need. Home improvement projects come with a surprising amount of math. When you’re talking about the surface area of a wall, this isn’t a problem, but what about estimating the amount of mulch you need for a certain plant? How about fertilizer? How much cement do you need in a hole that is also going to support a 4”x4”? 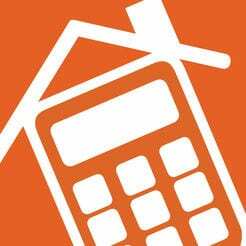 For these complicated calculations that require some background knowledge and a few steps, you can download the Home Improvement Calcs app. From knowing how much insulation you need in your attic to quick tile calculators, you’ll find it all in the home improvement calcs app. So you’ve moved into a house and you’re not yet that familiar with all the rooms. Now you can download the RoomScan Pro app, walk your phone alongside the walls and add the details for every room. No more calling to double-check the outlets when you’re 45 minutes away and pacing the aisles of the home improvement store. All the measurements for the rooms you’ve put in the app are readily available and can be shared, stored and sent as PDF files, and edited later. It’s the closest you’ll come to having your phone work for you. The iHandy Carpenter app comes with five essential tools for your carpenting jobs that will make sure your projects are level and straight. This app uses the positioning tools built in to your phone to allow you to check for straight and level surfaces. Once calibrated, you can use the plump blob, surface level, bubble level bar, protractor and steel ruler with a few touches on your screen. Perfect for a quick job where you don’t want to get out your toolbox, or for the beginner, who can download all five those tools for less than one of them would cost you in the store. A lot of the success of DIY projects depends on your handiness, but with these apps you have all the tools you need to put extra handiness right in your pocket. Do you have a DIY app that we missed? Let us know, and tell us what project you really used one for.